Akita’s rice is blessed with abundant nature. Every time we eat it, we feel the pleasure to live in Akita. Takashimizu would love to deliver our good sake made from Akita’s rice to people all over Japan. That is especially why we put great emphasis on the rice. 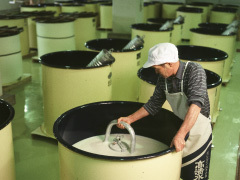 98-99% of rice used in Takashimizu is produced in Akita. (Quantity of using rice per year is more than 2,400t). Our company is supported by people who engage in rice farming and their effort and ardor. 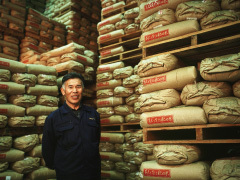 A conductor of brewing is SANNAI TOJI who is a specialist of rice cultivation. He distinguishes the quality and feature of rice every year, and always aims for high quality sake with substantial effort. Using rice and water of Akita, and brewing by Akita’s people. Every bottle is filled with lots of Akita, and its taste is rich and mild. Not only by the locals, but people from all over Japan enjoy and love our sake at home and Izakaya. Please feel our ardor for Akita’s rice when you sip. The taste which is allowed to have by only great quality sake; the comfortable flavor and the richness with sharp finish goes through your throat smoothly. For this taste, Takashimizu always put substantial effort. Polishing rice is also one of our most important processes. Polishing is necessary process to remove the undesirable outer part of rice which spoils sake taste. Therefore, we established our own polishing facility and polish carefully by using computer technology for achieving the superb sake. For rice polishing, precision is really crucial: ununiformed size of rice causes unstable brewing. Moreover, depending on variety, grade, and year, the condition and character of rice are really diverse. With adjusting resistance and rotation speed of polishing machine little by little, brewers polish several times in order to find the best polishing condition. Polish until satisfied. They always keep this in their minds and commit themselves for making high quality sake and delivering them to customers. Having the rich taste and flavor, but also smooth aftertaste. 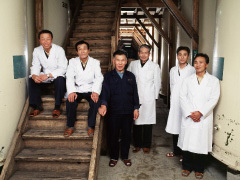 “Quality First”: the passion toward sake brewing have been passed down to people of Takashimizu for a long time. 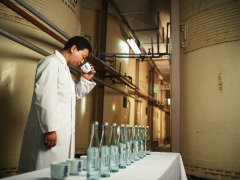 In order to carry out this policy, brewers always improve their skills and taste of sake. For example, “Koji”, as it is said “sake making is Koji making”, Koji has a quite big influence on the taste and quality of sake. Using lots of Koji makes sake mild and deep taste with smooth finish. However, even though breweries know the importance of Koji, some breweries are negative toward increasing the using amount of Koji from the view of cost and time. “Koji ratio” which indicates the percentage of Koji usage is regulated as over 15% for premium sake, and there is no regulation for ordinary sake. In Takashimizu, Koji ratio is more than 25% for not only premium sake, but also for ordinary sake. Taking time and using abundant Koji, we would like to deliver high quality sake which satisfy our customers. Without any shortcut, we always aim the authentic sake brewing. Shubo(Yeast Starter) -Strictly and gently nurturing yeast starter. All process of brewing sake begin with careful handwork. Takashimizu never forget the customers who look forward to drinking our sake, and we always try to deliver our best quality sake to them with lots of effort. “Quality First”, this is our creed. In order to achieve this, we put a great emphasis on manual labor as much as possible. Making Shubo (yeast starter) is one of examples. Shubo literary means “mother of Sake”, is one of the most important processes same as “Koji making” and “Moromi making”. In Takashimizu, we do this process with small tanks, and the reason why we choose this way is for careful works by human hands. People in charge of this process delicately work on lots of things; mixing gently with a paddle, controlling the temperature precisely with putting the heat pot or ice pot in the tank. Every Takashimizu sake is made by such mannual works. We spare no trouble for the quality. For customers who loves our products, we commit ourselves to brewing with ardor. During the winter, sake is brewed with lots of ardor and effort by Toji and our brewers, and in spring, fresh sake fills the storage tanks. However, this is not the end of our sake making process. In order to complete as a final product, another sake making starts. Sake brewing is affected by physical environment. Even when following exact same procedure, using the exact same ingredients, the result is different. Moreover, sake changes its taste as it ages. To respond our customers’ expectations and stabilize the taste consistently, we blend different tanks of sake having slightly different characteristics. The specialist in charge of this process knows well about the characteristic of each tank and consider the best match of sake. Moreover, he also knows the best way to drink sake during different times of the year and compensates for this by making fine adjustments. Putting lots of effort and passion on all of sake until the end of shipment. Taste of Takashimizu comes from the strong policy for the high quality. Takashimizu quality consists of people’s collaboration, inspiration, and skills. After the harvesting rice and winter approaches, nearly 30 sake making specialists including Toji, Kashira who assists Toji, and craftmen in charge of steaming, Koji making, Shubo making, Moromi making and pressing assemble at the brewery. We put a great emphasis on good teamwork and we truly believe that good teamwork makes good sake. The quality of sake is a direct reflection of the people who make it. Toji (brewmaster) pays attention to not only sake brewing but also other brewers’ condition. Most of brewers usually work as farmers or carpenters at a time other than brewing season. They know the importance of cooperation and also have a great respect to nature. For nearly half a year, until the following spring, sake specialists live together, work together and focus on making sake. Even though most parts of sake making is gradually automated, we still need their knowledge and experience. People’s harmony, sense, and skills, lots of wisdom support the quality of Takashimizu.